Haven’t we all dreamt of that warm summer holiday in a magical lake / river house that has both an amazing view and infinite adventure possibilities? Assume you found that exact same house you always conceptualize in your head and then imagine that beautiful extended lake or river bank but empty.Obviously something is missing and that might just be a fishing boat. If you had thought of that already then you’re on a row my friend but if you haven’t then allow us to fulfil your dream. 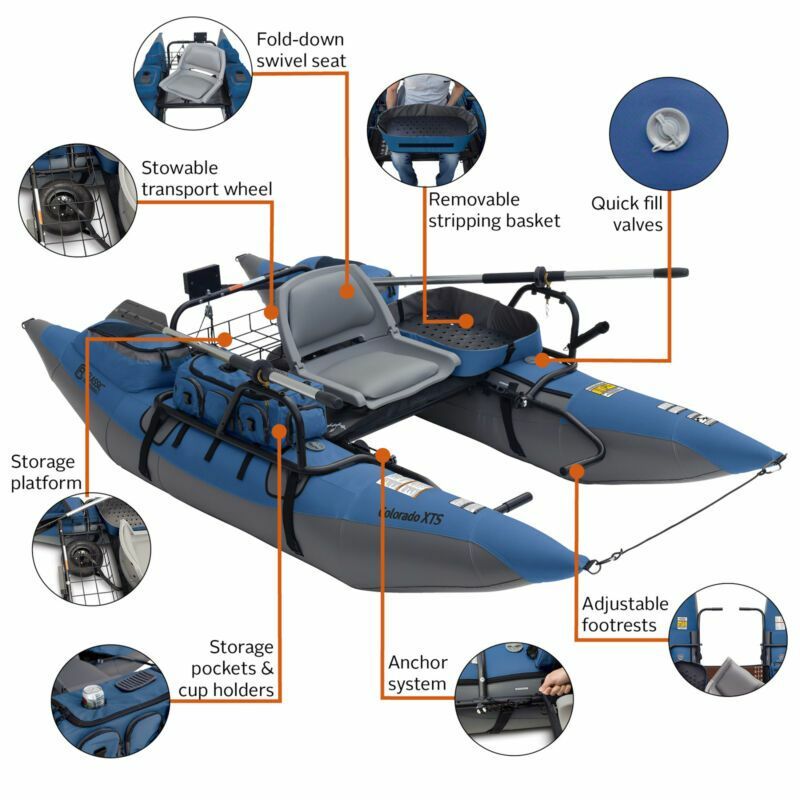 Say hello to the Classic Accessories Colorado XTS Fishing Inflatable Pontoon Boat. Yes, you heard it right; this is an inflatable fishing boat and just when you thought heaven doesn’t exist. Just imagine a full size boat that can fit inside the trunk of your car. If that isn’t impressive enough for you then let’s take an in-depth look at the Classic Accessories Colorado XTS Fishing Inflatable Pontoon Boat.and see what it has to offer. Now, length is usually a defining dimension for parallel pontoon boats because it significantly influences navigation, performance and accommodation. In terms of navigation, it’s no surprise that a pontoon will respond differently compared to a standard sharp hull boat. The pontoon is much more stable and significantly less agile than the standard boat which makes it great for fishing and smooth sailing. Performance is also influenced by the design of the boat but that is not something you need to worry about because this pontoon is not meant to race. Lastly, Pontoons are known for being less hospitable than standard boats because they can usually cater for one rider only as is the case with the Colorado XTS. Width has also quite the influence on the pontoon boat and that can be perceived easily through the 56 inches wide Classic Accessories Colorado XTS. 56 inches might sound proportional but in fact it’s about the perfect match for a 108 inches long boat. The Classic Accessories Colorado XTS is thus wide enough to remain almost static on water and equally balance through strong currents. Width is also of value to the space on top of the board which is occupied by the sailor, the equipment and motor. In terms of height, the Classic Accessories Colorado XTS reaches up to an astounding 28 inches which is significantly high for a regular boat but about perfect for a pontoon boat. Pontoons are void at the center, leaving the sailor suspended in mid air which is why the higher they are the better and drier they will be for the rider. As far as quality is concerned, you can easily argue that this right here is a prime example of what inflatable pontoon boats should be like. The Classic Accessories Colorado XTS can be inspected from two separate angles. The first thing you should worry about is how solid is the frame of the boat because it is essentially the core. In this case, the frame here is made of highly durable powder coated steel which might be heavier than aluminium but it’s also much more robust. Second thing to inspect on a pontoon should be the parallel air chambers because the last thing you want is to drown this boat. Luckily, the Colorado XTS’ air chambers’ bottom is strictly made of strong PVC material same as the one zodiacs are made of whereas the top is based off tough nylon. If that says anything about the board, it is how reliable it is under any condition. The features of the Colorado XTS are seemingly endless as this boat is fully optimized to cater for the perfect fishing trip. The list is indeed immense that we don’t even know where to get started. So, we’ll do our best to capture the most prominent / significant features of this boat while you can only imagine how great the rest is. First things first, take a look at that perfectly equipped platform. The platform of the boat is undeniably the most attractive thing about it because you can already tell that this is going to be a great boat just by looking at it. Most importantly, check out the holistic portable gear bag. A multi pocket bag has got to be every fisherman’s dream because it makes life so much easier but did you guess that the bag is actually made of combined removable side pockets? Probably not! Another enticing aspect of the pontoon is the fact that it is hooked with a transport wheel which will make transporting this boat to the nearest body of water a piece of cake. This feature will also prove significantly handy once you’ll need to return the boat to your vehicle. 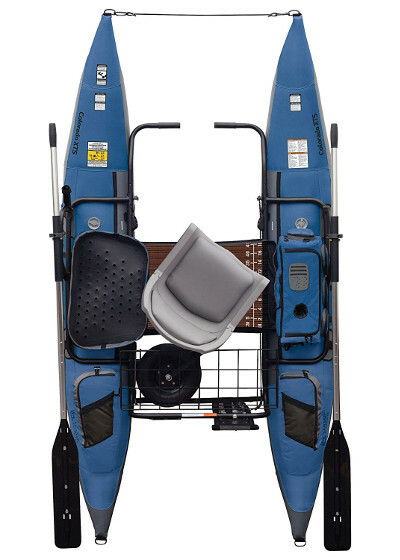 The Classic Accessories Colorado XTS also features a premium swivel padded seat which is not only extremely comfortable but also designed gracefully to improve mobility which is essential if you’re planning on using this board for fishing at all. Also, the seat is rightfully position at the center of the pontoon where it is visually fortified to cater for 400 lbs as a maximum weight capacity. Including the removable bag, the Colorado XTS exhibits an astounding storage capacity, including 20 pockets and two insulated drink holders for those of you who can’t go anywhere without a drink. 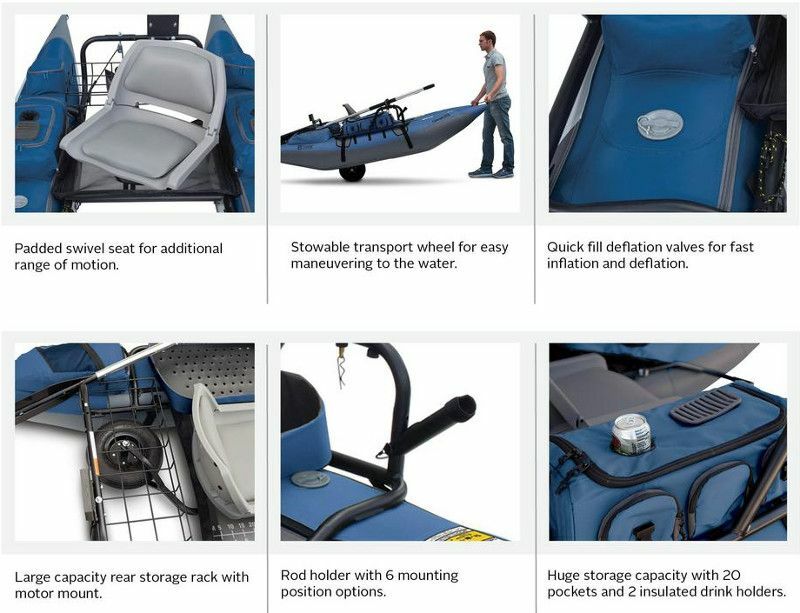 The practicality of the storage space on this boat is beyond words but do take into consideration labelling every pocket separately for an improved organization and easier access to your every tool. The Classic Accessories Colorado XTS also features one removable basket to the left of the sailor and a larger wire basket behind the seat both meant to transport and store your cargo. The side baskets can be properly used for fish bait alignment whereas the rear basket can be used for lower priority tools or fish. On the back of the wire basket, the boat features 2 position motor mount which is not essential but also quite handy. The motor is obviously not included but that does leave you with the possibility of installing one if you’re really not into paddling. In my opinion, I would say that the 7 foot long paddles that come with the board are beyond enough. As far as performance is concerned, the Classic Accessories Colorado XTS is a solid river / lake pontoon boat which can and will get the job done. This boat might not be designed for white water but it is optimized to perform extremely well on slight current and calm water. The body of the Colorado XTS is shaped properly to maintain strict balance and induce serenity and at that, there is no equivalent for the Colorado XTS. Do not feel intimidated by the boat’s size because believe it or not, this pontoon boat can fold down to fit a shoulder bag. This might sound unreal, but once you remove the steel frame, the rest is candy. The boat is really that flexible. So, make sure you read the instructions carefully the first couple of times but from then things will get much simpler. The best thing about the Colorado XTS is how resourceful it is. This pontoon literally includes everything you will need to enjoy your experience and maintain the boat for as long as possible. The quality of the boat is also of higher value here because it is an inflatable pontoon and the importance that was given to the material of build is comforting to say the least.